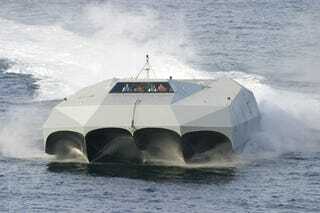 The Navy's 80-foot $6 million "Stiletto" with its Batman-esque twin m-shaped hull has been floating around as a prototype project for several years now, but it has suffered from budget cuts in the Defense Department. However, it appears that the Stiletto is starting to see some action in the war against drugs. Recently a group of drug runners in Florida tried to elude one by sailing near reefs and sandbars at 42 knots and skimming over water less than 5 feet deep. But the Stiletto kept on coming. After a two-hour chase, the drug boat finally ran out of gas and the passengers were apprehended. They told authorities that it was like being chased by a UFO. A UFO boat, huh? These guys were so f'ing high.